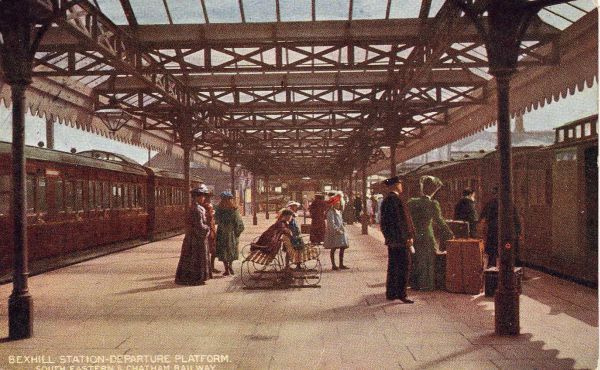 The Southern was the most colourful of the 'Big Four' when it came to buildings, and it used the same colour scheme throughout the grouping period from about 1926 when the standard colour scheme was introduced. On woodwork such as the underside of canopies a warm buff colour was used, known officially as 'Stone No. 1'..........a very slightly darker stone colour with a pinky tint, 'Stone No. 1A' was used on planking, canopy exteriors etc. For doors, framing, canopy pillars etc. a bright chrome green, (Green No. 3A), was used with a lighter apple green (Green No. 4) for the canopy brackets. Building interiors were cream apart from the green doors and the lower part of the walls. Window glazing bars & frames were white...the white was official colour no. 2. For a full specification, go to the 'BR SPEC' page of this web site, and also see www.semg.org.uk . 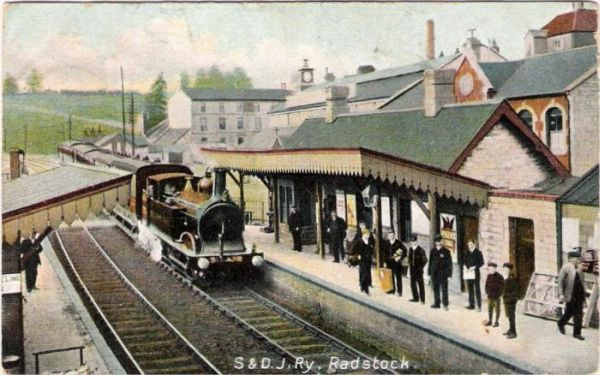 The 'Odeon' stations built by the SR had wooden window frames finished in 'oak' rather than white, which was simply the wood varnished or olied, while metal frames were white. 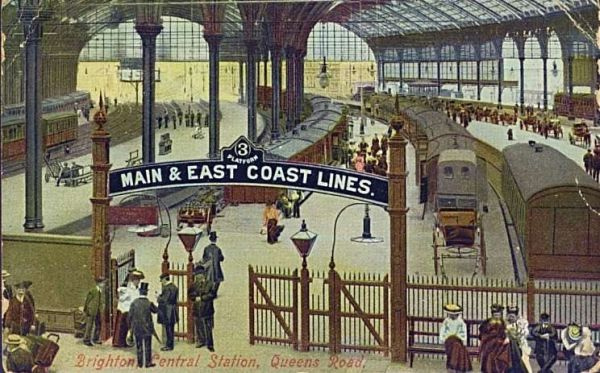 The wooden doors on these stations were also 'oak', with brass kicking plates at the bottom. 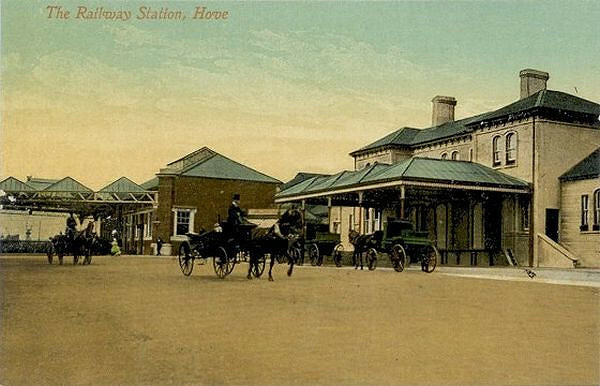 As it aged the green tended to turn blue, especially near the sea, and the stone went brown with age and as it got dirty so that a Southern station in need of a repaint could have looked most odd. 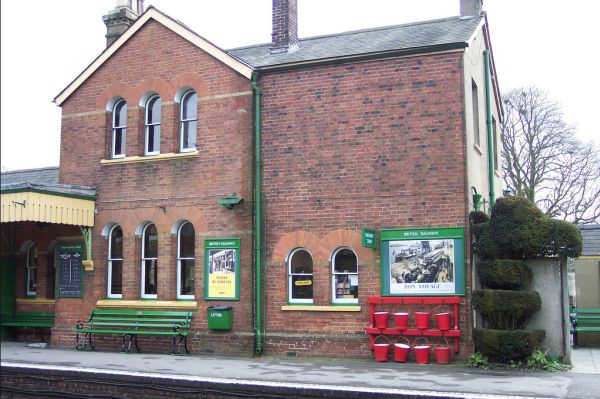 Signal boxes were painted in Stone 1A (dark stone) for the planking, and Middle Chrome Green (Green 3A) for the framing, steps, etc. 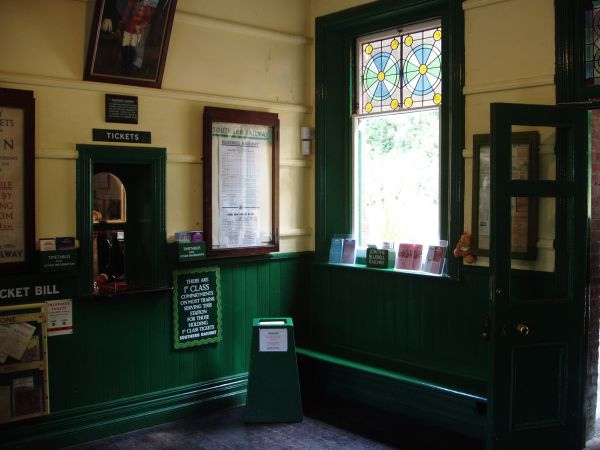 Poster boards were the chrome green all over with 'SOUTHERN' or 'SOUTHERN RAILWAY' lettering in white. Fencing was painted in the light stone. Cast iron warning signs were painted red with white lettering for mandatory signs such as 'No Trespass', otherwise green with white lettering. 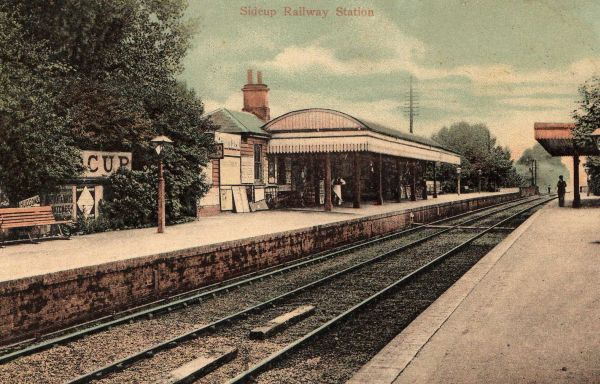 The SR introduced enamel station signs during the mid 1930's which were a darker green with white lettering. Buffer stops - the planks were painted white with a red stripe across the middle, each a third white-red-white. For every detail you could possibly want, go to the 'SR SCHEDULE' page. PAINTS FOR MODELLERS: Precision P93 SR Middle Chrome Green P88 Light Stone P89 Dark Stone. P95 Interior cream. Light green; no exact match but LSWR Adams loco green is close, and may have been what the SR were using up! The Precision Light & Dark Stone seem rather dark to my eyes, in which case using the colour patches or BS references is perhaps a better option. Many thanks to John Russell for much of this information. 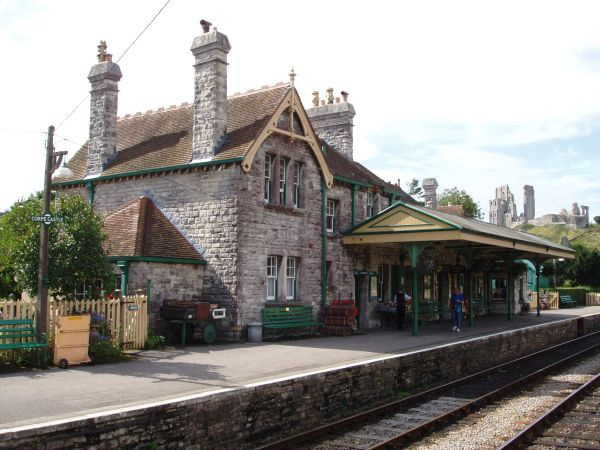 Corfe Castle and Horsted Keynes are both perfect examples of a Southern country station. 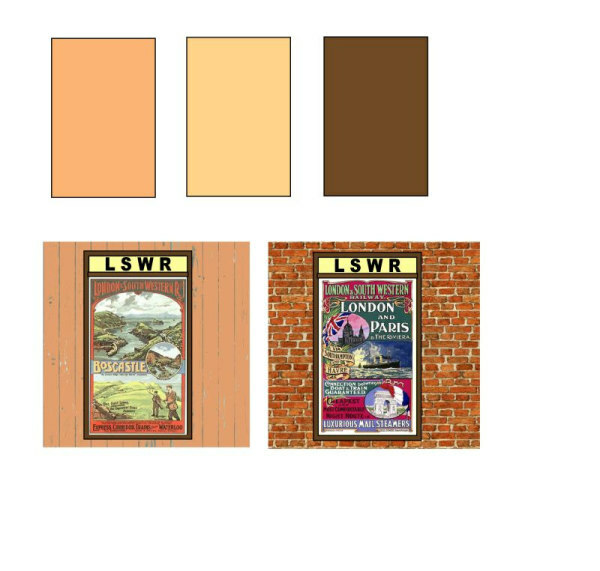 The LSWR used a scheme not unlike its coach livery, with a salmon colour for planking, valencing, etc and dark brown for doors, framing & metalwork. 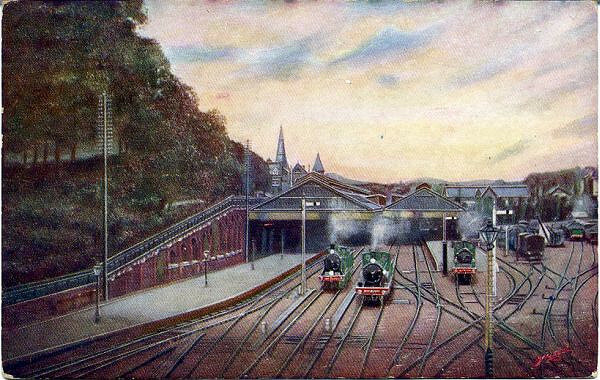 A cream colour was also used which could take the place of the Salmon, often on the same station, particularly on canopy valencing. Window frames & glazing bars were supposed to be white, but photo's show that some were a dark colour, probably brown. 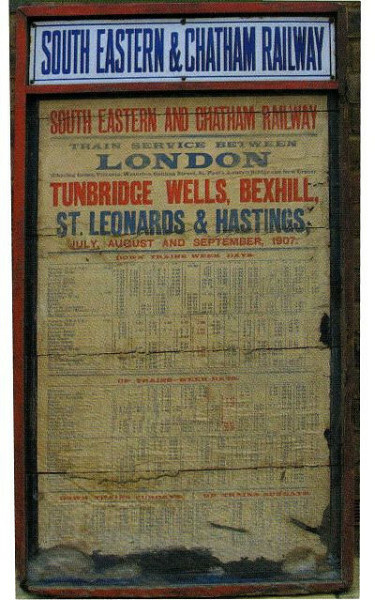 Poster boards were painted in the brown, with the top panel in cream with black lettering; this could be 'LSWR' or spell out the company name in full, and may have been enamelled metal. Cast iron signs were painted white with red lettering. PAINTS FOR MODELLERS: Brown- Tamiya flat brown or Precision LMS buildings brown. Cream- Precision SR buildings cream. Salmon- Either Precision LSWR coach salmon or Precision SR light stone. 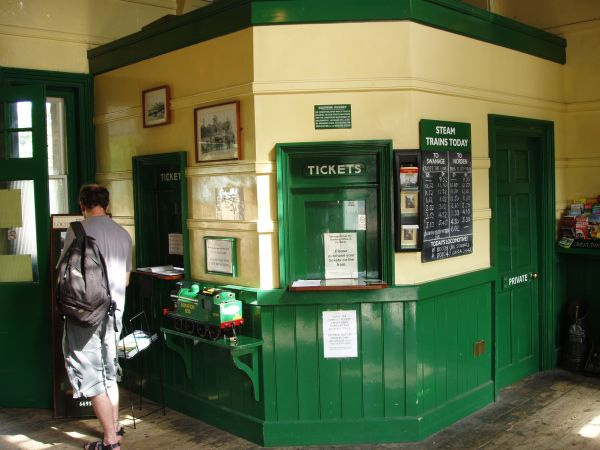 BEST PLACE TO SEE IT: Crediton station, currently the only station restored to LSWR colours. On the left is the interior of the roof of a preserved LSWR signal box (Honiton Tunnel West ) still with LSWR brown paint in situ. 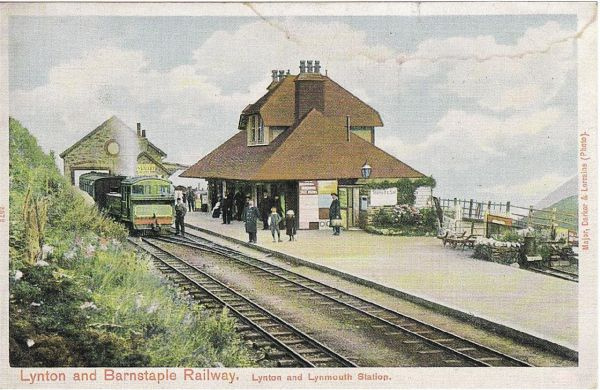 This seems to be the best place to deal with the L&B, as it was so closely associated with the LSWR. 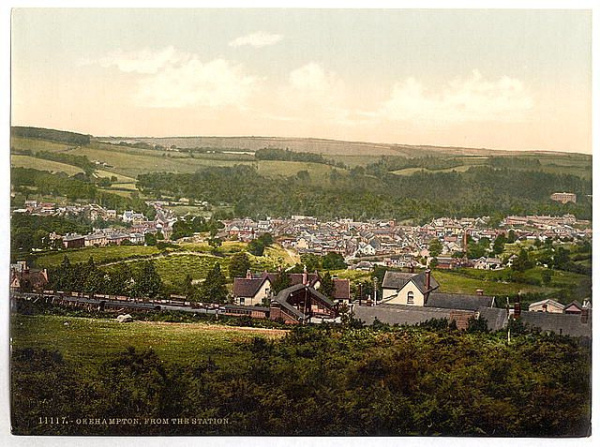 The two postcards shown below give a good impression of the line, but sadly are not much help when it comes to the colours of the buildings; I would be tempted to use LSWR brown, salmon & cream in the absence of any more definitive information. 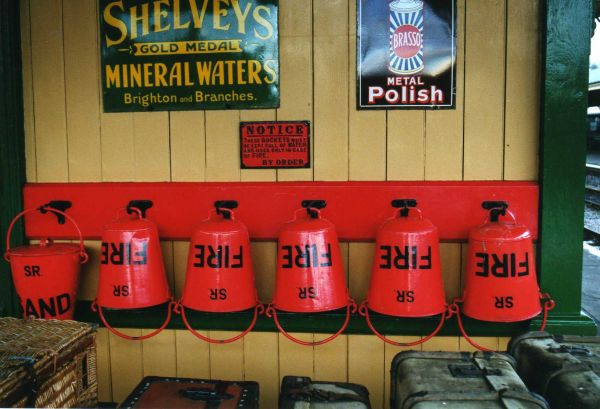 The 'Brighton' used a very pale cream for most of the woodwork on stations, with a deep red for doors, metalwork, etc. Window frames were painted in the cream colour. 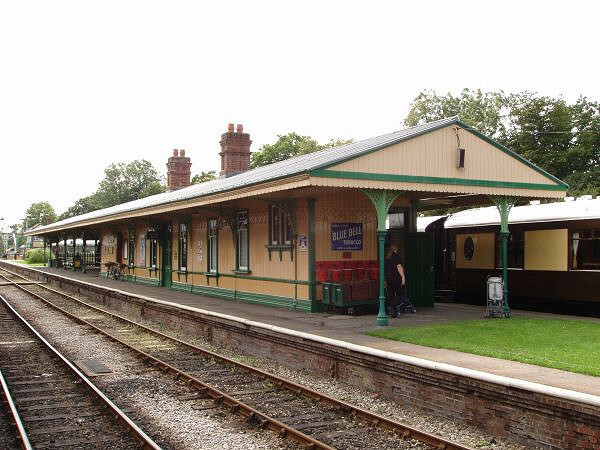 It was a simple yet attractive scheme, reproduced well at Sheffield Park station. 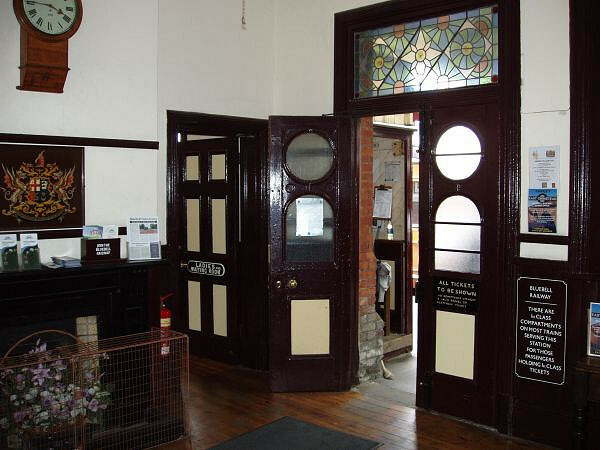 Before it was covered with tiling to keep out the damp, the timber frame & plaster panels on the upper part of the house section of these stations was finished in black & white; the tiling was put on during the 1880's. Poster boards were painted in the red, with the lettering in white. 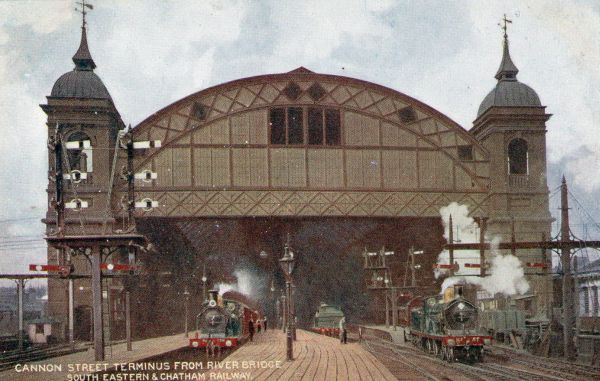 Footbridges, water columns and other steelwork were black. 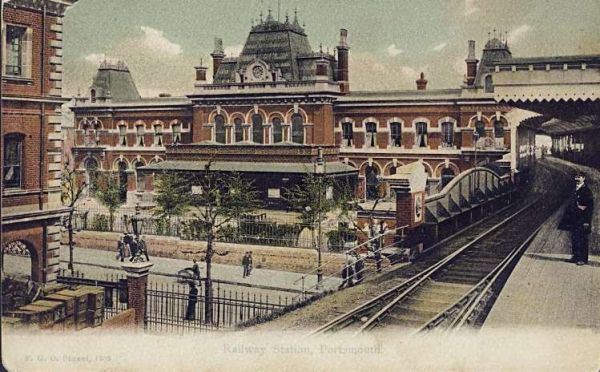 There is a suggestion that in later years some green was used on LBSC stations, possibly a precursor for the SR colour. 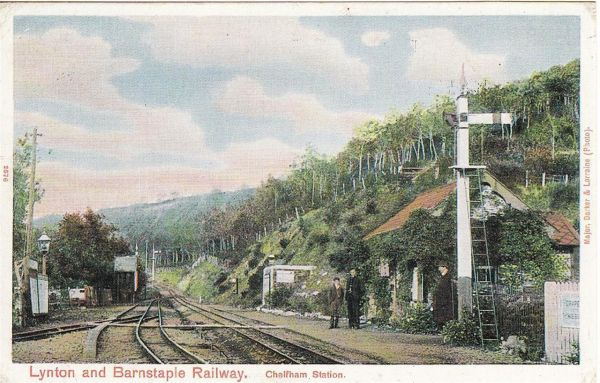 A 1912 specification for a motor train halt specified a green door, and adverts for the 'overhead electric' had white letters on a green background. There is also a possibility that seats and trolleys may have been painted green, but unless specific information comes to light I would hesitate to do this on a model. PAINTS FOR MODELLERS: Cream- Precision P355 Midland Railway lining straw. Red - Precision P18 GWR coach lake. 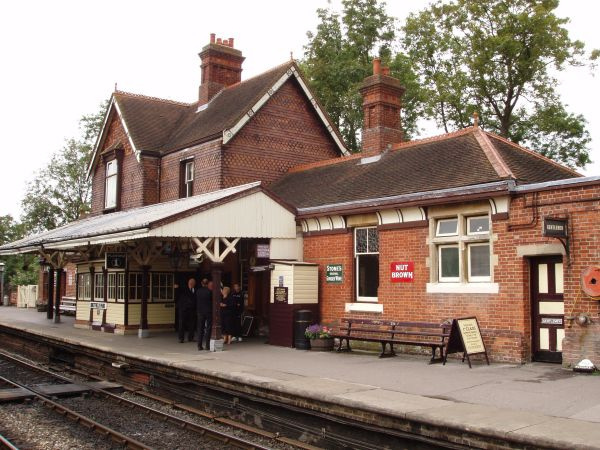 BEST PLACE TO SEE IT: Sheffield Park station, Blubell Railway. 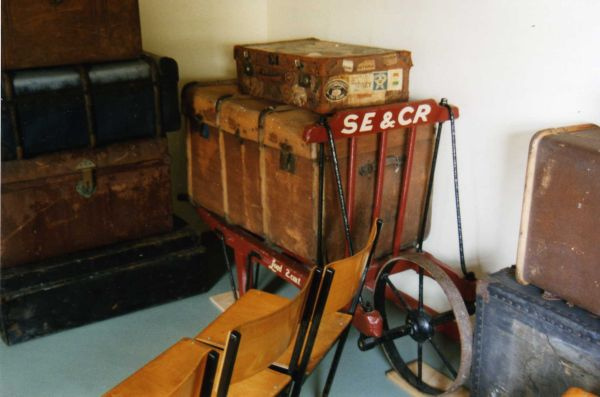 The SECR seems to have been unique among pre group railway companies in that it didn't have a corporate colour scheme for its buildings, in fact it doesn't seem to have had any guidlines at all. 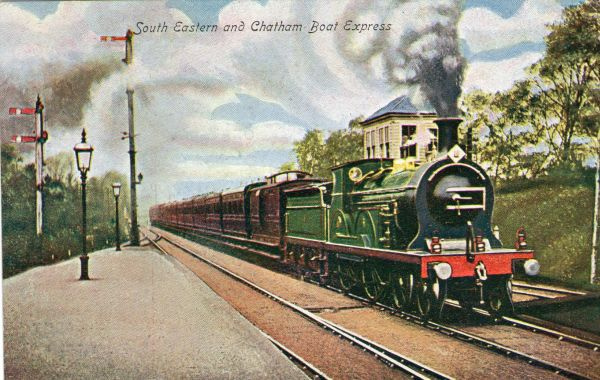 In this, it seems to have followed the practice of the South Eastern & the London Chatham & Dover from which it was formed in 1899. 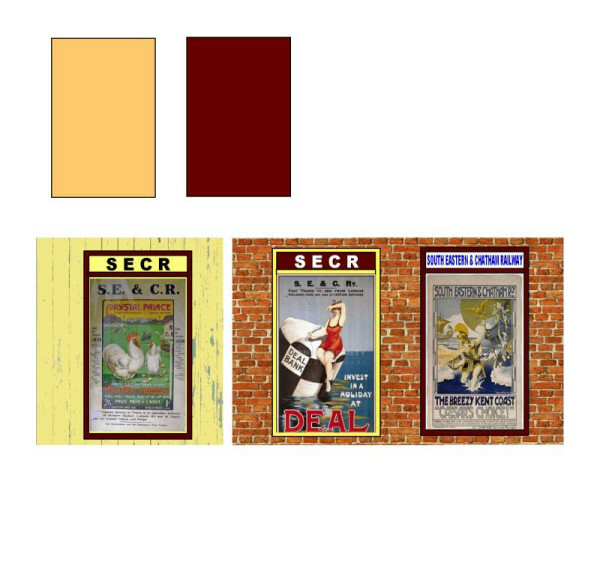 The only written references to building colours refer to stations on the SER being painted white, but photographs clearly show a two tone scheme in most cases and from studying numerous black & white pictures I think the common buff & brown is the likeliest combination. Window frames seem to have been painted white. Cream may have been used in place of the buff in view of the cream panel seen on poster boards. 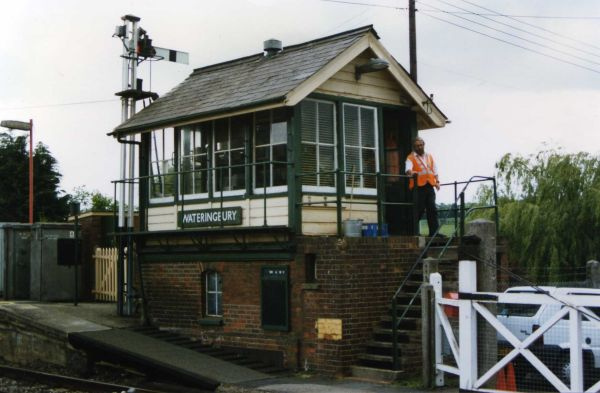 Some signal boxes had the dark colour on the botton 6' or so of the walls and the lighter shade above. 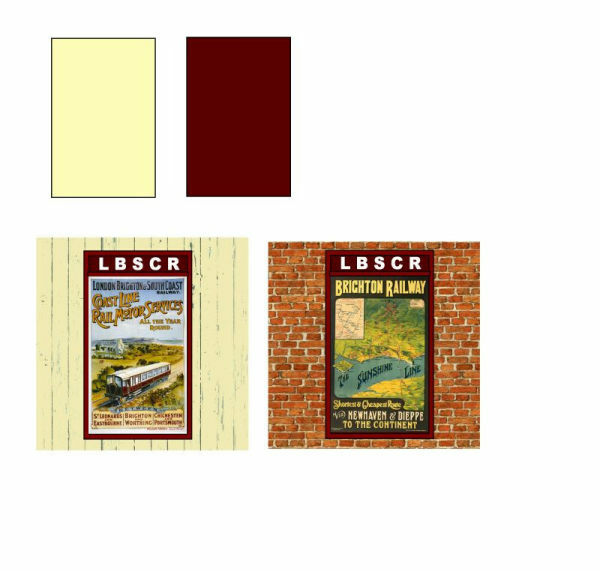 The LCDR colours from what I can tell from B&W photo's were buff/stone & brown, possibly the reddish brown seen on the preserved poster board. The SECR had a reputation for not keeping its stations well maintained, so paintwork might have looked rather shabby, in which case a cream paint might appear rather darker. Three styles of poster board have been recorded; they could be painted brown, with a cream top panel lettered in black (which may well have been an enamelled plate); they could be painted cream with a brown panel, lettered in cream. Thirdly, a preserved board is black with the framing painted a reddish brown which may have been the colour used on the buildings: an enamelled metal top panel is white with blue lettering. Station signs could also be enamelled in blue & white. 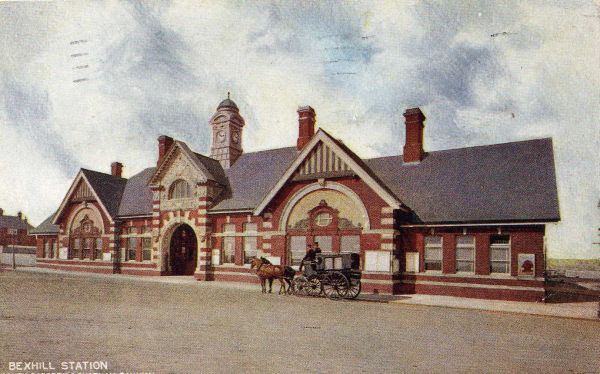 From postcard evidence it seems as though station running in boards were painted cream with brown framing and black or brown lettering, probably the former. PAINTS FOR MODELLERS: I would use Buff - Precision LMS buildings cream or Tamiya Flesh. Brown - Precision SECR loco frame brown or Tamiya flat brown. 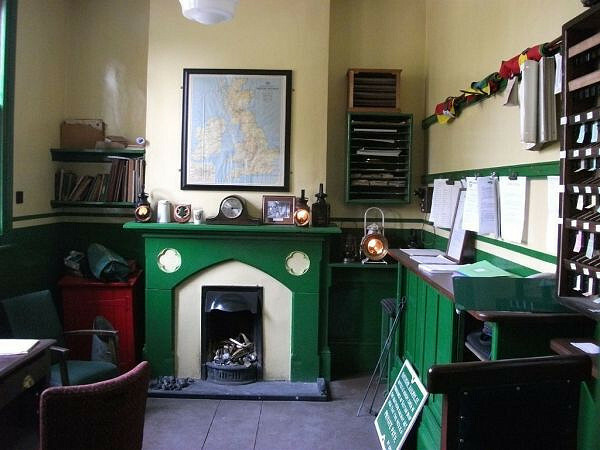 Once the joint line was in the hands of the SR & the LMS, the SR was responsible for the stations so they would have been painted in buff & green. 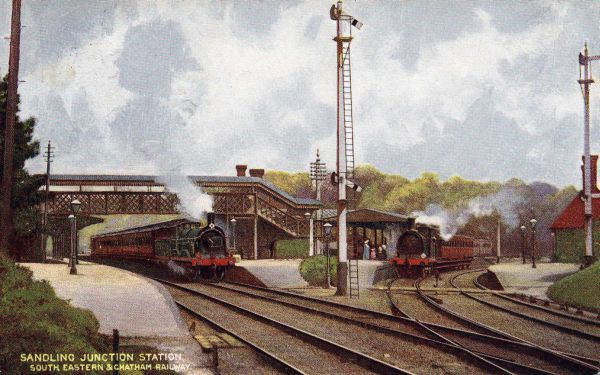 Before that, however, I have no information about the colour scheme used beyond the postcard reproduced below which shows a stone/cream & light brown livery. As it also shows the loco in brown, it may not be entirely accurate! Poster boards seem to have been all over black, with white lettering. 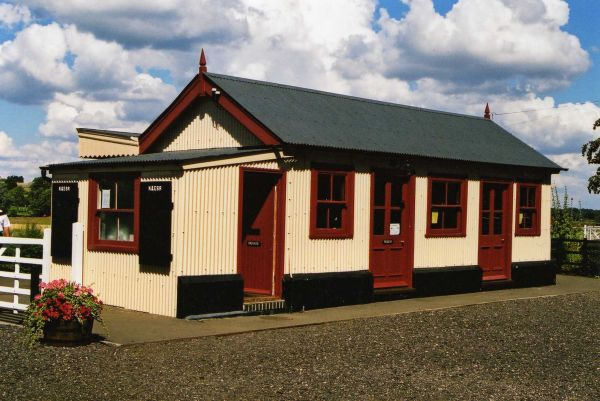 The preserved buildings on the K&ESR are painted in an attractive scheme of cream and red; whether this is authentic I don't know, but I have no reason to believe that it isn't. 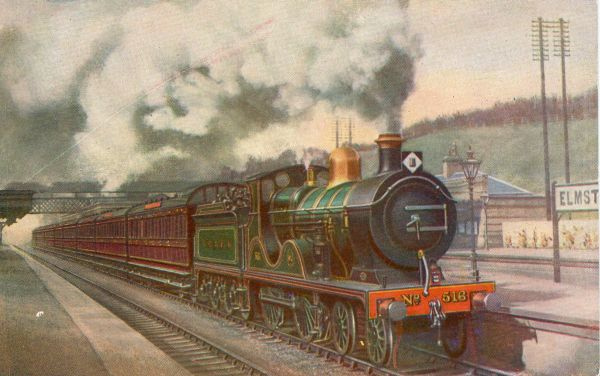 If it is accurate, it might also give a clue for other Colonel Stephens light railways. 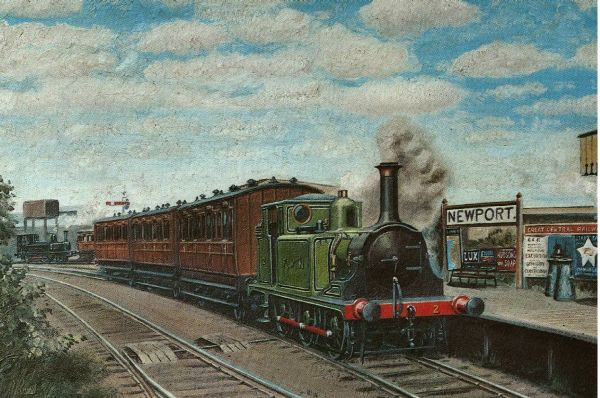 The only information I have is this painting of Newport station on the Freshwater Yarmouth & Newport Railway in about 1916; it shows the station in buff and brown. The running in board is white with black lettering, with the wooden frame and supports in brown. 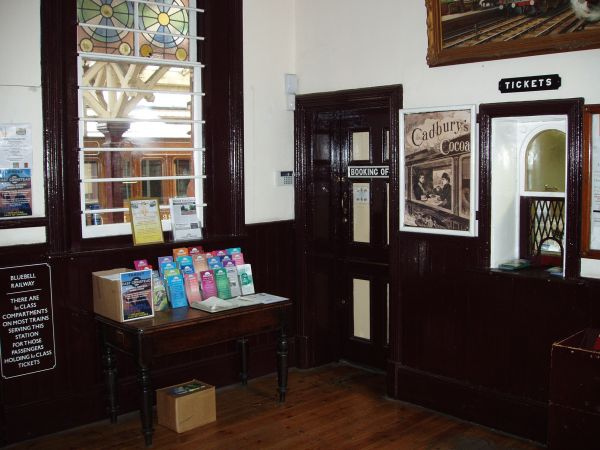 The poster board on the right is from the GCR and has a red top panel with white lettering, a colour that the GC never used....Sir Sam Fay was the Gerneral Manager so that may well expalin the connection. Of course it's equally possible that the artist just made the colours up! Thanks to Alan White for bhelp with this section. 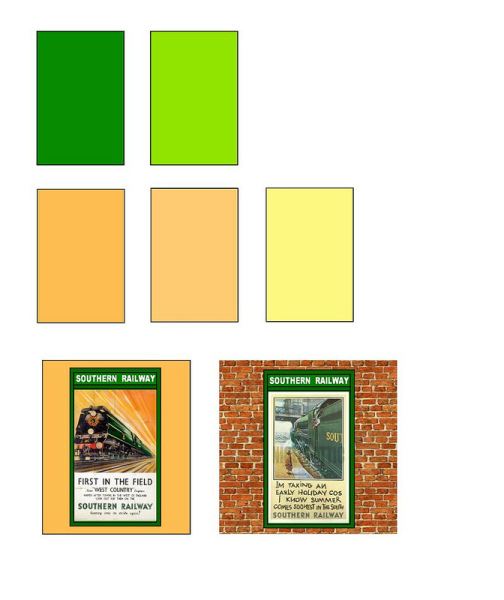 The Southern Region used the standard BR cream as a base with a green shade that was exactly the same as the SR Middle Chrome Green; the paint coNtinued to be supplied by the same manufacturer and the specification did not change. For a full painting specification go to the 'BR SPEC' page on this web site. BS381C references are thought to be BS381C 369 Biscuit and 226 Middle Brunswick Green; for colour patches follow the links on the 'Colour Patches' page. 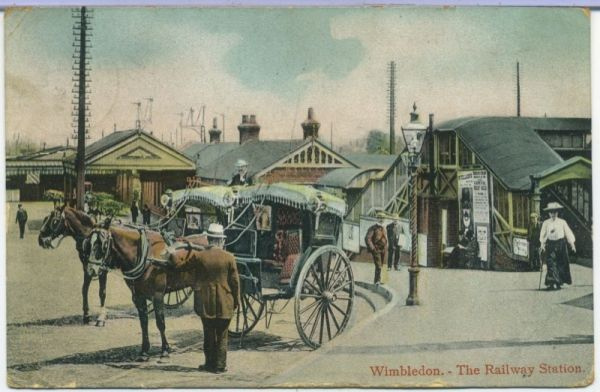 Poster boards were painted green with 'BRITISH RAILWAYS' lettering in white. Station signs were also green & white. PAINTS FOR MODELLERS; Cream - Precision SR buildings cream Green - Precision SR Middle Chrome Green. 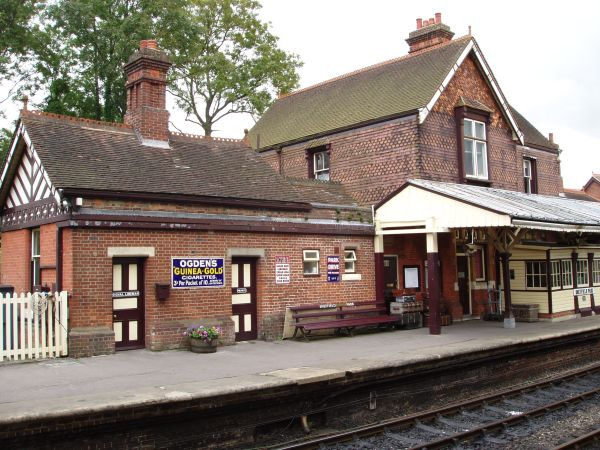 BEST PLACE TO SEE IT; Swanage Railway, Kingscote station on the Bluebell Railway, Ropley station on the Mid Hants.